Opening times Mon–Thu 8am–10pm; Fri/Sat 8am–11pm; Sun 9am–9pm. Pancake house doing US-style sweet and savouries, plus a pull-it-yourself bar with 16 taps. Stack and Still proudly boasts that it is the UK’s largest pancake house. And it certainly is large. Almost surprisingly large for a pancake spot. Are 200 people in Glasgow really going to want to eat pancakes at the exact same time? The regular queue snaking around the building on weekends would suggest yeah, they do. And it’s easy to see why. Stack and Still have nailed the interactive family dining experience. With over ten million different menu combinations, this is a place where you can be your fussiest self. 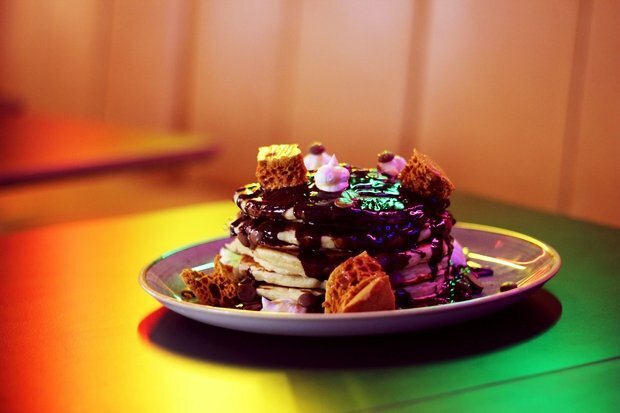 Pancake varieties include buttermilk, buckwheat, protein, gluten-free or sugar-free, which can be loaded with sweet or savoury toppings ranging from standard pancake stuff (maple syrup, Nutella, bacon) to more adventurous offerings (marinated king prawns, pickled red onion). The cost can creep up if you get carried away – meaning you get more bang for your buck from one of their signature stacks. The self-serve bar is a gimmicky bit of fun. Diners are issued with a card they can tap to activate various drinks pumps and pour themselves a glass of prosecco or a pint from their good selection of beers.